• and another student leader who helped to transform her campus. 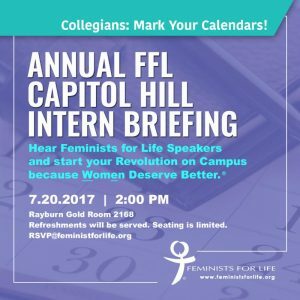 If you are an intern or collegian in the D.C. area and would like to attend the Briefing, please email rsvp@feministsforlife.org ASAP! Please help to underwrite this worthwhile expense. 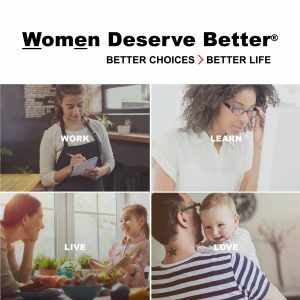 And finally, if you haven’t already, check out WomenDeserveBetter.com, We are so excited to share our new project with you, but we need your support now more than ever. Please be sure to promote our new site on social media and to print out and share our ads wherever you can. Finally, we encourage you to join Women Deserve Better’s e-list for the latest updates. A small group of dedicated supporters who are inspired by our summer events and impressed with our new Women Deserve Better website have offered a match for new and increased monthly and single gifts to either Feminists for Life or Women Deserve Better! The time is limited. The need is significant. Please join the effort! Thank you.